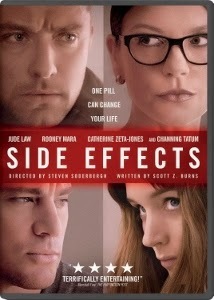 When I selected Side Effects off the shelf at my local movie rental place (yes, some are still around), I only heard that it was a drama with Jude Law and Catherine Zeta-Jones playing psychiatrists and that it involved anti-depressants. I chose it purely out of curiosity. For a sizable portion of the film, I thought it had a good message. I was left baffled at the end, wondering why the story ended the way it did. Directed by the legendary Steven Soderbergh, the movie starts out looking at Martin and Emily Taylor, played by Channing Tatum and Rooney Mara, respectively. Mara is best known as the title character in the American remake of The Girl with the Dragon Tattoo. They are looking to rebuild their lives after Martin is released from prison for fraud. After a failed suicide attempt, Emily is put under the care of psychiatrist Dr. Jonathan Banks (Jude Law). Aside from therapy, she is prescribed various psychiatric medications, none of which work. One final prescription, an experimental drug, has dire consequences. And unfortunately, the movie begins descending into a far-fetched plot twist that leaves you scratching your head. The film does a fantastic job of bringing to light the iron-clad influence that the pharmaceutical industry has on health care here in the U.S. A scene where Dr. Banks and his partners are having lunch and chit-chatting about a pharma-consulting gig he has really highlights this. That is a major message and commentary that is conveyed throughout most of the film and should have stayed the focus of the plot until the end. Instead, Emily kills her husband while supposedly sleep walking. Then Side Effects turns into a far-fetched crime drama in which Emily’s former psychiatrist, Dr. Victoria Siebert (Catherine Zeta-Jones), conspires with her on a financial scheme to manipulate drug companies’ stock prices. Emily and Dr. Siebert wanted to get Martin out of the picture so they can be lovers, not to mention attempting to destroy Dr. Banks reputation. You’d never see that coming. Nor, would you understand how it got there. Side Effects starts out as a movie showing the truth of the influence of pharmaceutical dollars at your doctor’s office. And it is done quite well for that matter. However, be prepared to have the rug pulled out from under you. I was disappointed by this film. The first act was good then through the second and third act, it fell apart with twists I didn’t care about.